Each box contains 17 packets of Night XL Pads (Maxi) Use. Each Night XL Pads packet contains 8 pads. At last! A sanitary pad that is hygienic, comfortable and environmentally friendly! 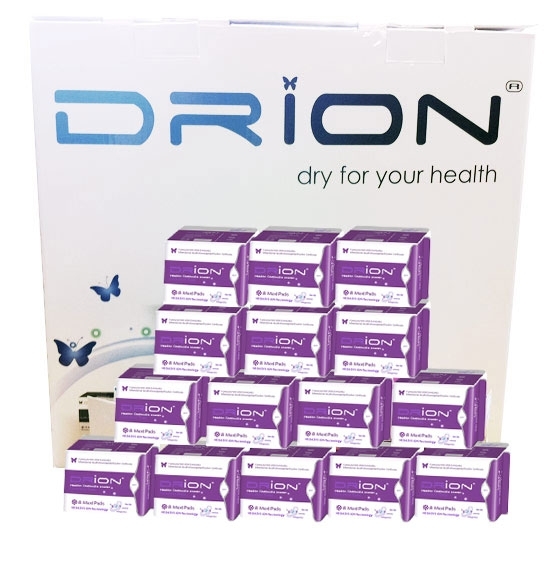 Drion sanitary napkins give you absolute confidence in your comfort and hygiene every month. Though, more than that, with Drion technology and biodegradable materials, you can feel reassured knowing that you are using a sanitary product that is healthy for your body and good for the environment. 83% of adult females have infected reproductive organs. 62% of them are caused by the use of toxic causing sanitary napkins and tampons. The World Health Organisation reported that in 2002, roughly 500,000 new cervical cancers were reported and among them there were 274,000 deaths. Since then there were more than 1,300 new cases reported each day and more than 750 cases of death per day. Do you ever worry about where your sanitary products end up? On average, one woman will use over 15,000 tampons or pads in her lifetime, most of which will end up in landfill or in the sea. Sanitary napkins with negative ions are effectively restrict the growth and survival of bacteria and viruses, activates metabolism, improves secretion and increases immunity. It is also effective in adjusting pressure, resisting bacteria, reducing inflammation and reducing odour. When your health is important consider the change to a healthier solution. Sanitary Napkins (and tampons) bought at most supermarkets or drug stores are made or bleached with chlorine compounds that contain trace of the organ chlorine dioxin. They are also made of recycled material which may contain trace amounts of copper, lead and zinc. These napkins can also harbour bacteria as they are not sterilized products. Most sanitary napkins may cause rashes, inflammation and even Urinary Tract Infections (UTI). It takes hundreds of years for a sanitary pad to decompose in the landfills. Drion Sanitary Napkins enhance your daily health with our “negative ions” strip embedded within every single napkin. All materials used in the making of the napkin are 100% safe and no chemicals are used. The materials used are raw and NOT recycled. NOW YOU CAN SAY GOOD BYE TO PAINFUL AND UNCOMFORTABLE PERIODS! Packed in sterile and airtight packaging so you can store them for longer. All Rights Reserved.No reproduction in whole or in part without written permission. are the property of Winasun Limited.